Think about those springy doorstops, the kind that taper up to a white rubber nub at the end, and go “sproioioioioioioing!” when you step on them accidentally while bringing in the groceries. I was terrified of those things for most of my childhood. Remind me to tell you the story sometime. Anyway, think of yourself carrying in a case of Diet Pepsi and a few bags from the grocery store; as you come in the door, you’re being extra careful with your cargo; you know you bought eggs and bread and bananas, but you don’t remember which bag your delicate foods are in so the caution lights are blinking away inside your brain. Because you’re so focused on the edibles you’re blindly trying to protect, you stomp on your doorstop and startle yourself. If you’re a clutz like me, you’ll probably drop the bags, and seven of the eggs are suddenly cracked, the bread is squished, and it looks like french toast is your only option for supper. Sometimes little things distract you so fully from the task at hand that you need to stop and regroup (or mop). These great but stealthy interruptions sneak up and tackle you from behind, and everything stops for a moment while you gather yourself. The best songs are like those springy doorstops. If you stop and use your rational human brain to address the music in pieces, to break it down into notes, rhythms, and lyrics, you see it as a song. It is an everyday object really, like that doorstop, which is a basic little device that you see most days of your life. Like the doorstop you step on when you least expect an interruption, though, the best music elicits an immediate reaction: it jolts you out of whatever mundane task you were attempting to fulfill. A song like that was played with a slideshow of old photos at my grandpa’s funeral in February. I’d never heard it before, and in spite of the emotion of the day and my exhaustion from the trials of the week that lay behind me and my family, everything halted for a few minutes. I just listened. “Where Rainbows Never Die” was a doorstop of a song for me. I’m sure The Steeldrivers song has struck many people as suddenly and completely as it hit me. 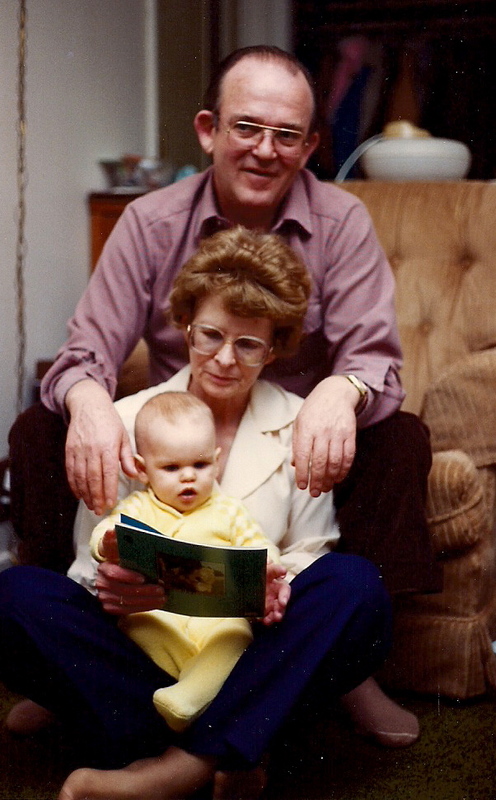 The only photo around where I have less hair than Grandpa. Go give it a listen by clicking here. Then come on back to Blue Speckled Pup, and click on the comments link at the bottom right of this post to share a song that’s been like a doorstop for you. “Where Rainbows Never Die” is a beautiful song. I’d have to say, Sugarland’s “Babygirl” will always make me think of my Mom. She has called me babygirl for as long as I can remember. I’d have to say though, Louis Armstrongs’ “What a Beautiful World” always makes me stop and close my eyes while I listen. I love Louis! That song makes me smile every time. Have you heard the Ramones version? Good Friday morning to you Kay.